The relationship between local charities and news, an app that tracks the diversity of local news sources, and the use of crowd-sourcing to track changes to local news organizations are among the ideas discussed in a new publication from Ryerson Journalism Research Centre (RJRC). The groundbreaking online multimedia journal published in early June combines academic papers, videos and a podcast to explore the decline of local news. “We wanted to create content that will draw in readers who may otherwise get turned off by seeing a long academic article that some people find boring or difficult to read,” says Jaigris Hodson, an assistant professor at Royal Roads University in British Columbia and co-editor of the publication. The Future of Local News brings together nine peer-reviewed papers by academics who attended Is no local news bad news? Local journalism and its future, a conference the RJRC organized in Toronto in June 2017. The impact of digital technology on local news research and local news itself is a topic explored in a number of the papers, including a piece by Malik and Ryerson associate professor Gavin Adamson. Their article outlines how an algorithmic tool they are developing can be used to track the diversity of sources in local digital news stories. Hodson says the editorial team also had the benefits of digitization in mind when deciding how to publish The Future of Local News. Hodson says that she hopes the journal will reach individuals in communities who “may not yet understand why they need to support their local news,” as well as entrepreneurs who can help find creative solutions to the problems presented. Above all, she says it’s her duty as an academic to making this research accessible to the public. From food, clothing and Christmas toy drives to raising money to send children to summer camp, Joyce Smith’s paper examine some of the ways in which “the worlds of local journalism and local charities have connected.” The paper dives into a short history of the news outlet’s relationship to forms of generosity and the alliances between news outlets and both religious and secular charities. It also examines how these relationships may change along with rapidly changing local news ecosystems. As part of an ongoing research project, Carrie Buchanan analyzed the content of three competing hyperlocal and community news outlets in the eastern suburbs of Cleveland, Ohio to see how each “differ in the sense of place they project” about the same community. The three outlets examined were The Heights Observer, a citizen journalism publication run by community volunteers; The Sun Press, a community weekly newspaper staffed by professional journalists; and Patch.com, which is part of a national network of hyperlocal websites. Buchanan’s content analyses of these outlets found that The Heights Observer was the only outlet to name more local than non-local places, and that it was the only outlet where the five most-named places were actually located within the publication’s stated coverage area. What’s the value of local media? This video explores what community journalism looks like in an area that isn’t well covered by mainstream media. It uses a case study of the 2016 visits by the Crystal Serenity cruise – the largest cruise ship to transit the Northwest Passage – to three small arctic Canadian communities. Researchers Tyler Nagel and Alycia Mutual analyzed the content of articles written about the cruise from local northern media sources, mainstream southern media sources and the CBC. This paper explores the “myth of the local,” i.e. 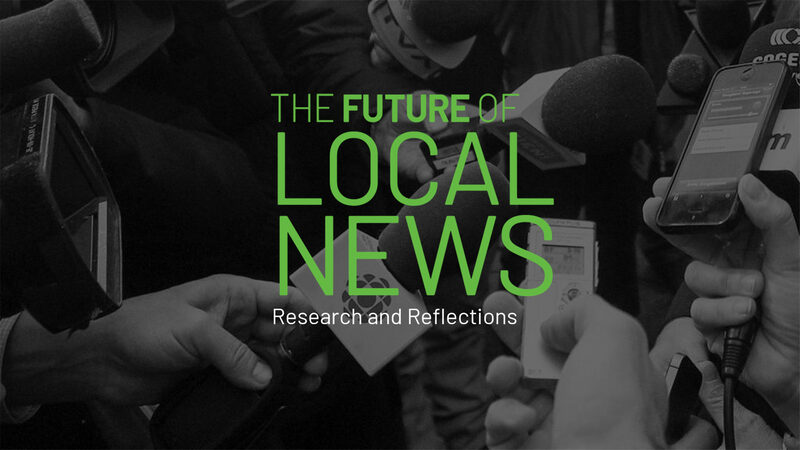 the presumption that audiences are highly interested in local news in their communities. This myth focuses on U.K. and U.S. audiences but may not be applicable to other countries, say researchers from Masaryk University in the Czech Republic. This paper uses a quantitative survey and interviews population to examine the Czech population’s interest in and relationship to local news. “What happens in Canadian communities that are underserved by national media outlets when local news outlets close down?” In this academic podcast, Jaigris Hodson examines how The Nanaimo Daily News’ failure to use social media to cover and engage with readers during the 2015 election may have foretold the publication’s closure in 2016. Using this case study and a study of how little local political issues in Nanaimo were discussed via Twitter during the election, Hodson counters the argument that social media can easily bridge the hole in local communities left by the loss of local news outlets. Just as computer mapping software has become a standard feature in today’s newsrooms, Geographic Information Systems (GIS) can be used to analyze and visualize the geographic distribution of news itself. Using sample data of geographic references from local news items published in the Toronto Star, this paper demonstrates how GIS can identify concentrations and gaps in local news coverage. “To whom do journalists speak? Who do they quote? From whose point of view are stories told, and whose voices get the most prominence?” These are some of the questions that led to the creation of JeRI (the Journalism Representation Index), software that can identify, quantify and categorize the sources quoted in news stories. In this paper, Gavin Adamson and Asmaa Malik detail the development of this algorithmic tool and how they tested whether JeRI can make same the simple judgments about sourcing as humans. The Local News Map is a “crowd-sourced web-based mapping tool that invites the public to contribute information about local newsroom startups, closings, and service reductions/increases.” Researchers April Lindgren and Jon Corbett discuss how the data collected acts as a “straightforward tracking device” of changes to local media. They also note, however, that maps are not neutral and go on to evaluate The Local News Map’s strengths, limitations and biases.